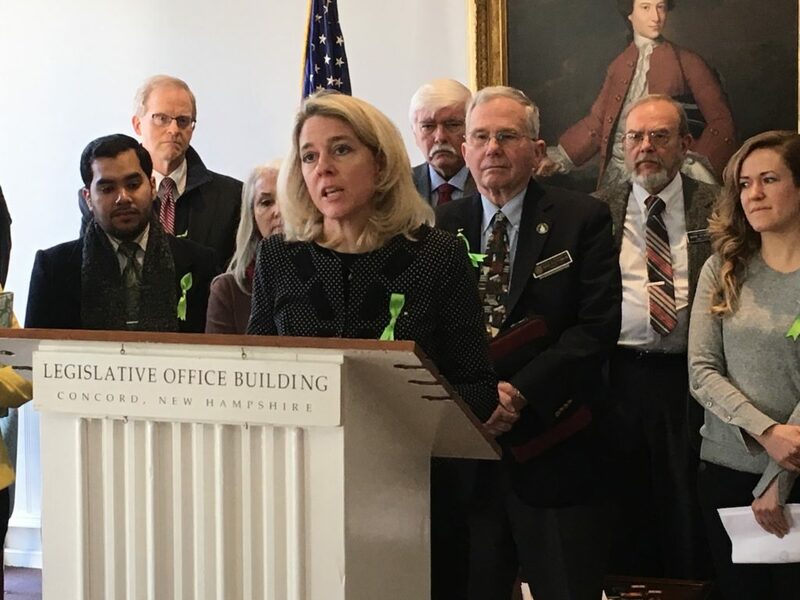 A bill to provide protection for viable preborn children brought a crowd of supporters to Concord to urge House legislators to do the right thing. 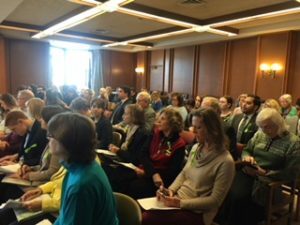 Cornerstone’s Shannon McGinley and Gabrielle Jette were at the January 31 hearing on HB 1680, the Viable Fetus Protection Act, calling for an end to the state policy that leaves abortion unrestricted throughout all nine months of pregnancy. Rep. Keith Murphy (R-Bedford), chief sponsor of HB 1650, at press conference on the bill. 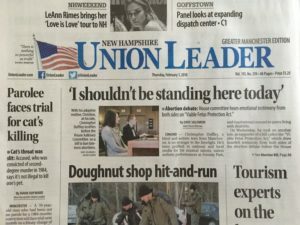 The New Hampshire Union Leader gave front-page coverage to the hearing on HB 1680. 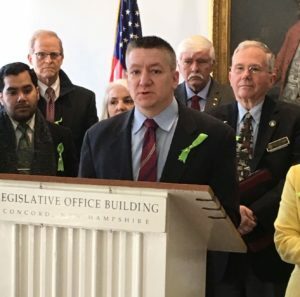 The most compelling testimony of the day (attracting front-page coverage in the New Hampshire Union Leader) came from a young man who was born at 26 weeks gestation, when aborting him would have been legal in the Granite State. Now 16 years old, Christopher Duffley told members of the House Judiciary Committee about how his life was affected by the people around him who saw his innate value, irrespective of his state of development at birth: his adoptive parents, the medical personnel who worked to save him, and a teacher who perceived his talent for singing and performance. The room was full when the House Judiciary Committee took testimony on HB 1680. Photo by Gabrielle Jette. Rebecca Schmitz testified about her son Micah, born at 30 weeks gestation, now a healthy boy about to celebrate his ninth birthday. Rebecca recalled that after Micah’s birth, “They quickly rushed him down to the NICU. Post-surgery, they were working rather quickly to get me down there to see him. They even pushed aside the incubators in the NICU to roll my entire bed down so I could be next to my son. The hearing on HB 1680 was followed immediately by a hearing on another bill supported by Cornerstone, HB 1721, banning coercive abortions. So many people wanted to testify that time ran out. The committee chairman has the option of scheduling another session to allow for more public testimony. The Judiciary Committee has not yet scheduled a vote on either bill.